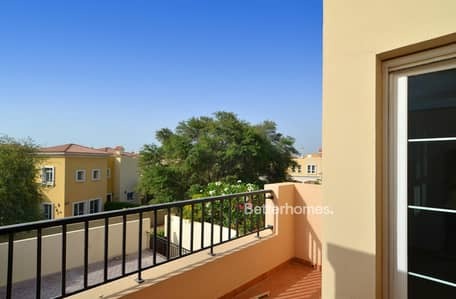 Better Homes Real Estate are pleased to offer this immaculate type 3M in Al Reem 1, Arabian Ranches. Upon entering there is a spacious open plan kitchen/dining area with access to large garden via patio doors, guest bathroom, utility room and large study. Upstairs welcomes 3 double bedrooms with fitted wardrobes, master with en-suite and balcony over looking the garden, family bathroom and storage cupboards. To the rear, the garden has been nicely landscaped and enjoys a small patio area for BBQ and seating area. Each neighbourhood has a swimming pool, dedicated barbecue area, tennis and basketball courts as well as lovely landscaped parks and footpaths. The Ranches is divided into distinct communities of tree-lined streets and quiet cul-de-sacs and it is a very pleasant and scenic place to live.